In rural areas across Appalachia, economic development has often led to profits for large, outside companies with little benefit to local people, businesses, and communities. In these conventional supply chains, each link in the chain works for its own self-interest. Rural Support Partners believes that the idea of a value chain offers a framework for economic development that is more collaborative in nature, and more likely to benefit more of the people in the communities where the chain is based. Value chains bring together a network of businesses, nonprofits, and collaborating players to satisfy market demand for specific products or services. Because value chains are built in response to market demand and involve clear and constant communication, they can be more responsive and innovative than traditional supply chains. We use the term Value Chain to draw a comparison to a traditional business Supply Chain, where the key difference is that a value chain’s structure and functioning acts more like a complex, cyclical network than a linear chain. Value Chains Are Demand-Driven: Thanks to a closer link between producers and consumers, producers enjoy regular insight into consumer preferences, which helps them respond to changing demand. For example, customers and farmers (or producers) have direct connection at farmers markets when the farmer sells his/her produce and hears the preferences, questions, and concerns that are on customers’ minds. Cooperation & Collaboration Are Essential: In conventional supply chains, similar products or services compete for market share, and businesses ask, “What is best for me and my business now?” In value chains, relationships between similar producers use cooperation and collaboration to foster mutual support so that value chain members ask, “What can I and my business do to maximize the economic, environmental and community benefit to all value chain members?” The shift from self-interest to group-interest helps provide economic and social benefits to all value chain members as they share in making decision, taking risks, and reaping rewards. Consistent Communication: Consistent information must flow between value chain members in order to maintain trust, increase efficiency, reduce risks, and promote innovation. Specifically, value chain members may share research or tools that serve to increase productivity and reliability across the whole chain from cut and sew, to dyeing, and completion. For example, members of a textile value chain may share research, tools, and equipment that enable members to work with a new type of fabric. Since they often specialize in different steps in product development, the designer can work with multiple value chain members to produce their design from sourcing to finished product. Hold a Common Set of Values: Value chain members come together in the first place because they find they have shared values to produce their product or services in ways they can meet consumer expectations for environmental conservation, social responsibility, and economic development. Value chains are often used to revive heritage industries whether in a single community or connected across a region. Both cases are rooted in place and value, for example, being able to provide economic opportunity to younger generations who struggle to stay in rural areas affected by mechanization and the global economy. 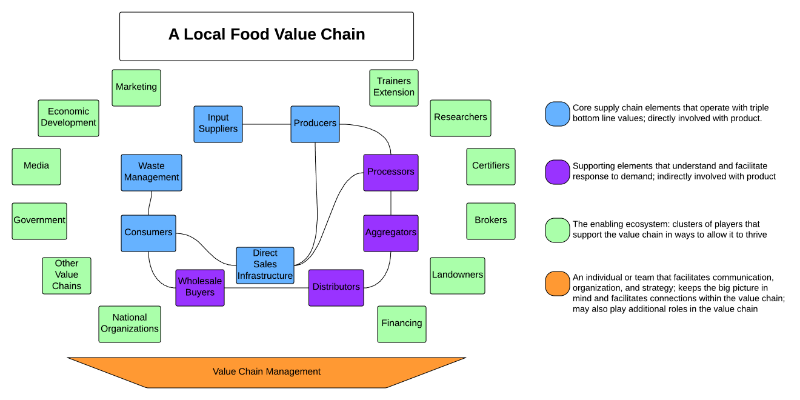 How Is a Value Chain Structured? The example value chain in the diagram to the right demonstrates how a product moves through or is supported by the actors shown, either as a core element that is directly involved with the product, a supporting element that helps facilitate and respond to demand, the actors that indirectly support the value chain’s ability to thrive, and the value chain management. Value chain management plays an important role that ensures the health of the value chain system from the core members to the supporting players. This team or individual pays attention to all the characteristics described above and facilitates internal and external communication, organization, and strategy to meet demand. Importantly, this element of the value chain requires staff time and capacity so that the manager can wake up thinking about the success of the chain every day.